What Made CC&F an Incubator For So Many Development Companies? 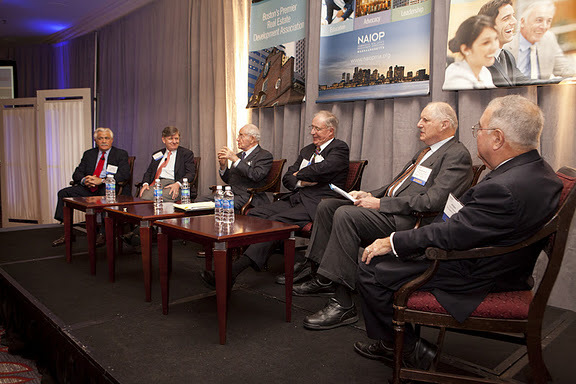 At NAIOP’s recent program, Get Inspired with Gerald Blakeley and the Icons of Boston Real Estate, panelists and CC& F alumni discussed the culture at Cabot, Cabot & Forbes and why it resulted in launching the careers of so many of today’s local and national icons of commercial real estate. Many younger real estate professionals may not realize that CC&F was the national pioneer of over 20 million SF of suburban master planned business parks. During the program, Gerry Blakely, CC&F’s former CEO, described his start leading the company. Back then, the land use for industrial properties was either building footprint or paved parking. Very different from today, there were virtually no setbacks, landscaping, or design covenants. CC&F’s new model was a commercial business park that established development restrictions and dimensional requirements more strict than the underlying zoning. Although few banks wanted to risk lending for such a radical and risky venture, CC&F was able to get started and soon proved the profitability of this new concept. In 1948, CC&F opened The New England Industrial Center – the country’s first master-planned business park. With the preservation of natural site amenities and consistent design standards, this facility quickly became a prototype for business parks that has been emulated worldwide. CC&F was also responsible for creating millions of square feet of first-class office space across the country. Their Boston landmark properties include 60 State Street, One Boston Place, 100 Summer Street, and 28 State Street. As Bill McCall, President of McCall & Almy, pointed out, the people that Gerry attracted to the company were the brightest around who all shared a strong drive to succeed. These were entrepreneurs taking charge of their own particular divisions within CC&F, whether it was for the industrial, office, or national build-to-suit markets. The obvious risk was that they were hiring the kind of personalities that would ultimately want to do this work on their own behalf. Although that proved true for many of the alumni, the company benefitted from that intense, productive energy. The list of CC&F graduates is impressive and includes: Don Chiofaro, President, The Chiofaro Companies; Ferdinand “Moose” Colloredo-Mansfeld, Senior Advisor, Cabot Properties, Inc.; Terry Considine, CEO, AIMCO; Arturo Gutierrez, Chairman, The Gutierrez Company; Mort Zuckerman, Chairman; and Ed Linde, former CEO, Boston Properties. The legacy of Blakeley and CC&F lives on with so many of the alumni actively involved as leaders in our industry. At the conclusion of our program, NAIOP presented the chapter’s first ever Lifetime Achievement Award to Gerry Blakeley for his contribution to the industry and his impact on Greater Boston. This entry was posted in NAIOP News and Events, Owners & Developers, Uncategorized and tagged CC&F, Gerald Blakeley, NAIOP by Tamara Small. Bookmark the permalink.